If you’re anything like me, you probably check your Facebook account at least five times a day. It’s something pretty much all of us do, but have you ever wondered why we feel the need to check up on our friends, or why we want to comment on their statuses or “like” their pictures? It’s no secret that humans are highly social creatures,but did you know that human social tendencies are actually something we inherited from a long line of primate ancestors? Primates, including humans, are known for forming long-lasting social bonds, even with individuals they are not related to. Scientists studying social relationships in primates are able to reconstruct vast webs of social interactions, otherwise known as social networks. Social network analysis enables scientists to understand the strength and make-up of social groups, and has broad applications for understanding the transmission of ideas or diseases within populations. Among humans, information spreads rapidly as a result of the internet and social networking sites. For example, remember in February of 2015 when the question of what color a dress in a photo was hit the internet by storm (blue and black, or white and gold)? Don’t worry, we’re not going to dispute the color here. What was so amazing about “The Dress” dispute was that, within 48 hours, millions of people worldwide were discussing “The Dress”. This rapid spread of information, facilitated by the internet, would not be possible without social networks and our primate driven need for social interaction. So how do scientists analyze social networks? Let’s look at a basic example. In the figure below, each red dot represents an individual. The lines connecting each dot indicate an interaction between individuals. To go along with our social media example, let’s assume the interaction between these individuals was that they shared pictures of “The Dress” with each other. In our example social network, these individuals are connected only to each other through mutual picture sharing. The above example is pretty simple, but social networks can be incredibly complex, as the picture below shows. Social network connections can be weighted, meaning that some are more important than others. They can also be directional, meaning that the relationship or behavior only goes in one direction. In primates, direction and weight are important factors in measuring the stability of relationships. One social behavior that is commonly mapped using social networks is grooming. 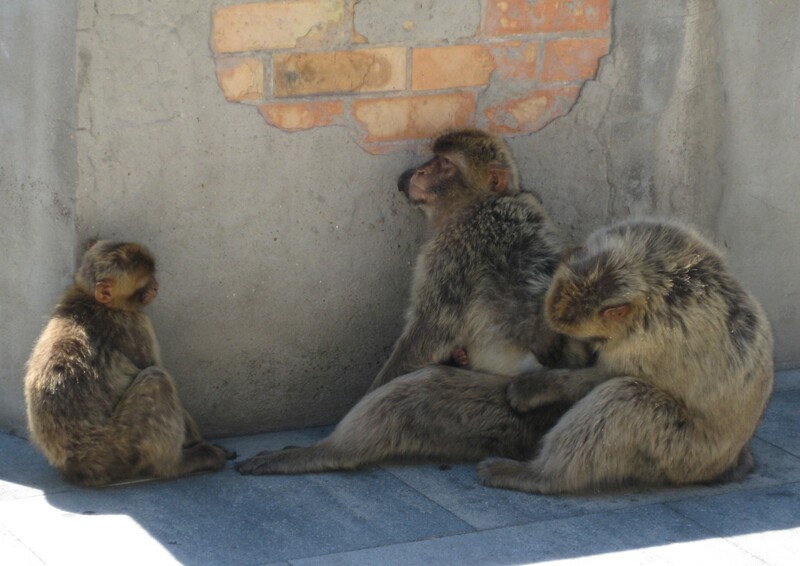 Primate grooming is a behavior where one individual picks through the hair of another individual. Initially, scientists believed that primates groom mainly for hygienic purposes. However, over time it has become apparent that primates groom to strengthen social bonds, build alliances, and gain favor with higher ranking individuals. In order to create a grooming network for primate groups, researchers record which individuals groom each other and how often. If two individuals groom each other more frequently than they groom other individuals in the group, then we can infer they have a strong social relationship. By constructing social grooming networks, we can analyze group stability and even predict potential fission events. 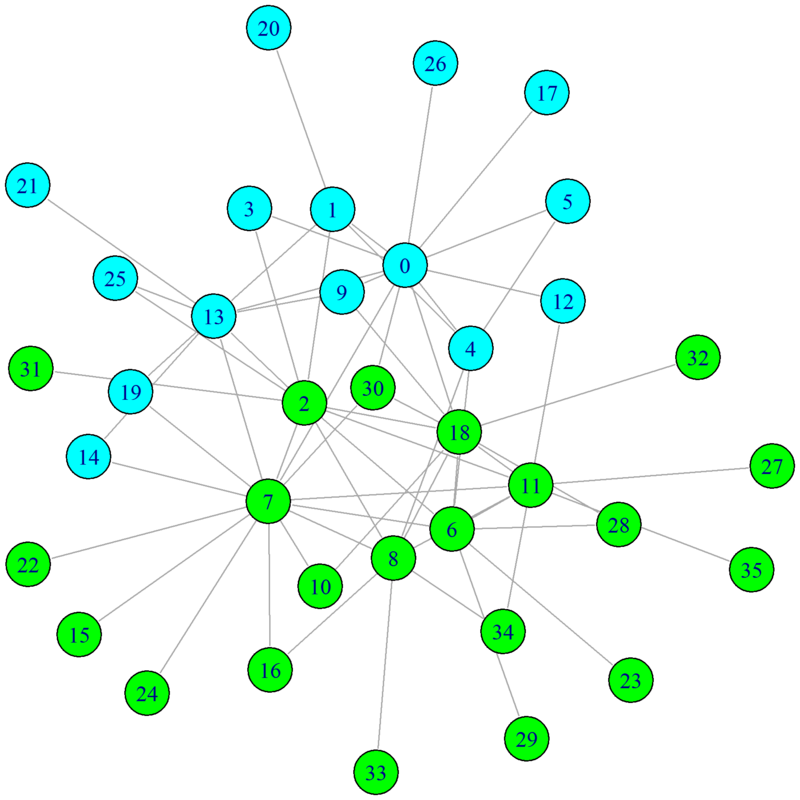 In the social network diagram below, a handful of animals are connected to the group by a grooming relationship with only one other individual (for example, individual 20). These individuals are considered less central to the network, or peripheral. If this individual were to leave the group, their absence would not significantly affect the social network structure. By analyzing primate social networks, we can identify core members of a primate group. When we relate group structure back to the concepts of transmission of ideas and human social networking sites, the individuals in the center of social networks with the most connections have the greatest potential for the spread of ideas. So next time you share a cat video on social media, think a little about your own social network and the role you play in the distribution of ideas. Beisner BA, Jackson ME, Cameron AN, McCowan B (2011) Detecting Instability in Animal Social Networks: Genetic Fragmentation Is Associated with Social Instability in Rhesus Macaques. PLoS ONE 6(1): e16365. doi:10.1371/journal.pone.0016365. Dunbar RIM (1991) Functional significance of social grooming in primates. Folia Primatol (57):121-131. Wey T, Blumstein DT, Shen W, Jordan F (2007) Social network analysis of animal behavior: a promising tool for the study of sociality. Animal Behaviour 75: 333-334.